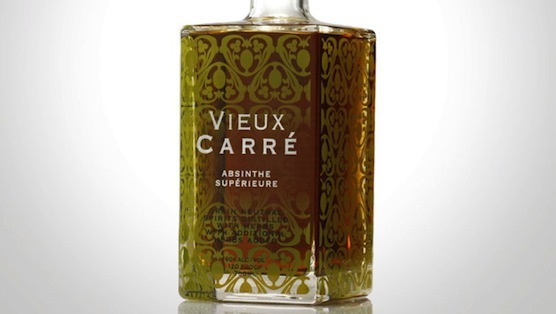 Philadelphia Distilling’s Vieux Carré Absinthe Supérieure was the second absinthe on the market after its legalization in 2007, and as one of America’s first legally bottled boozes of its kind, it has set a precedent (and high bar) for craft absinthe distillers to come. For those who don’t know much about absinthe, here’s a quick crash course. Absinthe is a spirit, and has its own liquor category, like vodka and whiskey. It was banned from the United States until 2007 because the Federal Drug Administration thought its key botanical, grande wormwood, had hallucinogenic properties in the chemical compound thujone. This means during its ban, all absinthe distilled in the United States wasn’t true absinthe since it lacked the wormwood ingredient. To be classified as an actual absinthe, the spirit must contain “the holy trinity” of principal botanicals, which are grande fennel, green anise and grande wormwood. After finding that the chemical compound thujone existed in other foods (sage and yarrow), the FDA legalized the distillation of absinthe in the U.S. and now craft and commercial distillers are bottling it for consumption. Yay! Rather than using a base of eau de vie (white grape spirit) as a foundation, like traditional European absinthes, Vieux Carré’s base spirit is made from a mix of corn, wheat, rye and barley. Philadelphia Distilling takes this neutral-tasting liquor and re-distills it with herbs sourced from around the world — star anise from China, petite wormwood and genepi from Switzerland, anise seed from Egypt, fennel from Provence and grande wormwood from Croatia. The raw botanicals (grande wormwood, green anise and star anise, fennel du Provence and lemon balm) are heated and soaked in a copper pot overnight. Then the spirit (which is still clear) is combined with the botanicals that give the absinthe its verdant color. Spearmint, lemon balm, hyssop and petite wormwood steep in the alcohol and release their chlorophyll coloring. The color and flavor from all-natural botanicals sets Philadelphia Distilling’s absinthe apart from the mass-produced absinthes on the market that sneak in food coloring, giving them a mouthwash-green color. In the end, you get a full-bodied layered liquor with pops of herbal, earthy flavors, and a complexity that rivals other craft absinthes. If you find absinthe’s anise and fennel flavors peculiar rather than palatable, give one of these five cocktail recipes a try. The effervescence of Champagne or fruity notes of pear brandy may just turn you onto this herbaceous spirit. Pour the absinthe and the chilled Champagne into a flute and serve. Combine the absinthe, Cointreau, vodka and lemonade and shake with vigor. Serve on the rocks in a highball. Pour the absinthe, Cointreau and cold water in highball with ice and stir. Pour the absinthe, pear brandy, fresh lime juice, rich simple syrup and an egg white in a glass and stir. Garnish with nutmeg and bitters. Pour the gin, fresh lemon juice, Lillet, Cointreau and absinthe in a coupe and stir.